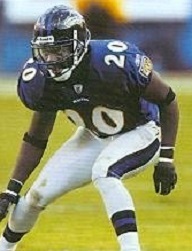 Reed was chosen by the Ravens in the first round (24th overall) of the 2002 NFL draft and was inserted into the starting lineup at strong safety. He made an impression with his skill as a tackler combined with his ballhawking ability. Reed had five interceptions as a rookie, which he returned for 167 yards. He quickly developed into a premier player at his position. Ravens went 10-6 to finish first in the AFC North. Lost AFC Wild Card playoff to Tennessee Titans (20-17). Reed followed up in 2004 with a season in which he led the league with 9 interceptions and a then- record 358 return yards, and was named NFL Defensive Player of the Year by the Associated Press. He had a lesser year in ‘05 as injuries limited him to 10 games but, shifted to free safety, came back strong in 2006 as he regained his status as one of the dominant defensive players in the NFL. After 11 seasons capped by a championship in 2012, Reed left the Ravens and signed with the Houston Texans for 2013 but was waived during the season and signed by the Jets in what was his final year. Reed was a consensus first-team All-NFL selection on five occasions, received at least second-team consideration after three other seasons, and was named to nine Pro Bowls, including seven straight from 2006-12. He led the league in interceptions twice more, with 9 in 2008 and 8 in 2010, and had a career total of 64 that he returned for a NFL-record 1590 yards and seven touchdowns. 61 of the interceptions were with the Ravens, making him the club’s career leader by far.